The landord of the Victory Inn in St Mawes has recently taken over the Roseland Inn in Philleigh and is giving it a new lease of life after the previous tennants decided to move on. Phil & Debbie Heslip took over the Victory Inn in June 2006 and have done exceddingly well in increasing the pubs trade and popularity. The pub has two rooms available on a bed and breakfast basis and an upstairs restaurant with terrace. Clearly however, running one pub wasnt a big enough challenge and in May this year they became the new tennants of the country pub 'The Roseland Inn'. The Roseland is in the hamlet of philleigh and is a short distance from the King Harry Ferry making a convienient place for lunch and dinner for those visiting the Roseland Peninsula or Falmouth. 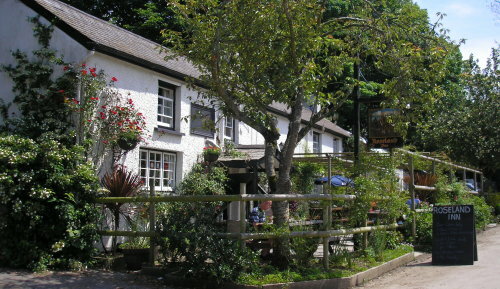 The pub has a confortable bar area with an ajoing restaurant and ample seating outside the front of the pub. Since taking it over Phil has had the pub stripped back and redecorated giving it a nicely polished feel.